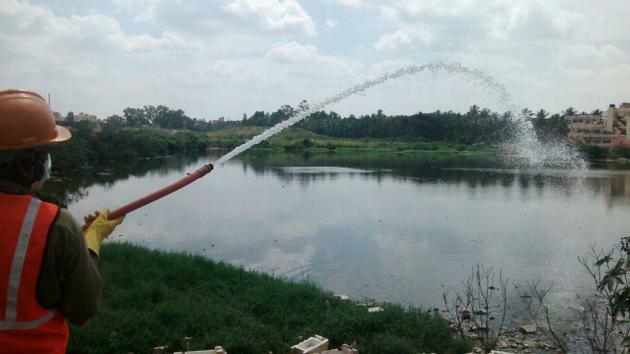 EM solution being sprayed at Byrasandra lake. 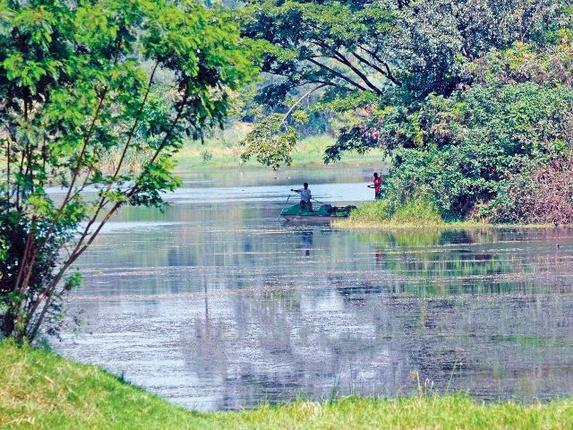 With the cash-strapped civic agencies struggling to rejuvenate lakes under them, the government is increasingly trying to rope in the private sector to revive the waterbodies in the city. K.J. George, Bengaluru Development Minister, had announced recently that the upkeep of Ulsoor lake was being given to a private developer, while at least 14 lakes currently with Bangalore Development Authority (BDA) will be developed under the public-private partnership (PPP) model. “We have just received instructions, and we’re still chalking out the modalities. Perhaps, private companies will fund the rejuvenation and can place their advertisements (for revenue or branding purposes). We’ll have to look at the model adopted by the Bruhat Bengaluru Mahanagara Palike (BBMP),” says T. Sham Bhat, BDA Commissioner. The concept becomes lucrative for the BDA which struggles to raise money for nearly 123 lakes that come under its purview. Officials estimated that each lake takes up to Rs. 5 crore to rejuvenate entirely (not counting larger lakes such as Bellandur where the detailed project report itself shows nearly Rs. 300 crore as needed to revive). This revenue, officials concede, is far above their reach. With 14 private players already roped in to help maintain lakes, the BBMP has been on the lookout for more companies to supervise and fund the maintenance of lakes. Officials believe these lakes — where, an agreement is made between the BBMP, the local resident association and the private company — are the best kept among the 66 lakes under their jurisdiction. Officials, however, said most of the interest had come for lakes only around the IT zone of Mahadevapura and Sarjapur, and in areas such as Yelahanka where high-rises dominate the landscape. For instance, the recently rejuvenated Dorekere, where a few months ago thousands of fish were found dead due to pollution, has not received any interest from private companies, said B.V. Satish, BBMP Chief Engineer (Lakes). “We are in touch with non-governmental organisations to rope in some private assistance. But, we have difficulties in lakes in areas such as Magadi Road or Dasarahalli where only small industries are present,” he said. Citizens and a private company joined hands on Sunday to clean out Byrasandra lake in Jayanagar. Though the recently rejuvenated 15.11-acre lake was filled to the brim following the rains, the overflowing storm-water drains had brought sewage and trash from the neighbouring areas. The decomposed waste was then raising a stench in the area. Based on a request by residents of the nearby RBI Colony, and local elected representatives, nearly 500 litres of E.M. (‘effective microorganisms’) solution was poured into the lake. In 10 days, another 500 litres will be poured in, said Kiran P. Kulkarni, lake activist and a businessman who provided the solution. The cost — coming to Rs. 50,000 — will be borne by the contractor, who “developed” the lake. The E.M. solution has several breeds of live microbes, including yeast and photosynthetic bacteria, which break down sewage and filth. Mr. Kulkarni expects the pollution to reduce by one-third in the coming weeks, and effectively neutralised in the coming months. The technology had been implemented partially in Belandur lake, where out of 12,000 litres required, nearly 4,500 litres had been poured; while Ulsoor and Cubbon Park lakes had been temporarily cleansed since 2009. A limit on the phosphorus content in detergents to 9 per cent may ensure lowering foaming in Varthur lake, said Almira Patel, who is the National Green Tribunal member on Solid Waste Management, at a brainstorming session held on Sunday. The discussions, which saw the participation of scientist T.V. Ramachandra and representative from NGOs, was held to scour for solutions to incessant froth formation at Bellandur and Varthur lakes. Other suggestions included compulsory labelling of heavy metals and chemicals in detergents as well as tackling solid waste in storm-water drains. “We will take this matter up with Karnataka State Pollution Control Board as well as with petitions to the government,” said Elangovan K., member of Whitefield Rising.